We’d love your help. 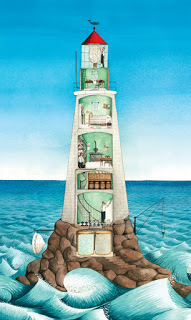 Let us know what’s wrong with this preview of Hello Lighthouse by Sophie Blackall. To ask other readers questions about Hello Lighthouse, please sign up. at the edge of the world stands a lighthouse. It is built to last forever. Sending its light out to sea. The fog rolls in, and the fog rolls out. Expressive text and rich imagery beckon the reader to the shore, to feel the sea breeze blowing, see the waves rolling, to witness the beacon guiding ships safely by. Hello Lighthouse provides an illuminating look at the life of a lighthouse keeper and is a delight for all ages. I enjoyed the very informative author’s note just as much as the story itself; it really rounds out the details for inquisitive minds. Each year my family reads all the Goodreads-award-nominated picture books, and we have been doing this for years. Everyone rates each book and adds a comment and it may (or may not) affect my overall rating. This is book #9 (of 20) of 2018. We were excited to read this book because as we travel, we visit lighthouses, and are especially fond of visiting them around the Great Lakes. We've read a number of books about lighthouses, too. Lyra (11): 4 stars.The drawings were beautiful and simple. Sweet Each year my family reads all the Goodreads-award-nominated picture books, and we have been doing this for years. Everyone rates each book and adds a comment and it may (or may not) affect my overall rating. This is book #9 (of 20) of 2018. We were excited to read this book because as we travel, we visit lighthouses, and are especially fond of visiting them around the Great Lakes. We've read a number of books about lighthouses, too. Lyra (11): 4 stars.The drawings were beautiful and simple. Sweet book! Hank (12): 3.5 stars. I like the drawings. Harry (13): 3.5. I especially loved the drawings of the water. Tara: 4 stars. I found the facts, the information, fascinating. The cute-sy stuff in between just okay. I’ve loved lighthouses since I was a girl, and I know I would have pored over this book many times during preschool and early elementary grade ages. I enjoyed viewing the lighthouse rooms and their contents. Entrancing and enchanting. As a child the pictures could have kept me captivated for long periods of time. The illustrations definitely make the book. They’re gorgeous. Mesmerizing. The illustrations of the lighthouse and especially the natural beauty of the sea, sky, rocks are spectacular. I’ve loved lighthouses since I was a girl, and I know I would have pored over this book many times during preschool and early elementary grade ages. I enjoyed viewing the lighthouse rooms and their contents. Entrancing and enchanting. As a child the pictures could have kept me captivated for long periods of time. The illustrations definitely make the book. They’re gorgeous. Mesmerizing. The illustrations of the lighthouse and especially the natural beauty of the sea, sky, rocks are spectacular. I wasn’t 100% a fan of the depictions of people but I liked them well enough. The repetitive lines story was rather sad, and more than a bit gloomy at times, though it’s also sweet and has an ending that while not idyllic is pleasant and happy enough. Some might also love the story but this could have worked fine for me as a wordless or nearly wordless picture book. For young children I can see how the words might be lulling and entertaining. The final two text pages about lighthouses and their keepers for older children/readers were interesting and were for me a welcome part of the book. This is a lovely book and can be enjoyed by independent readers, reading aloud for families, schools, libraries, etc. With a wonderful and sweetly nostalgic marriage of lyrical text and glowingly imaginative but nevertheless always spectacularly realistically shining accompanying images, I have both absolutely loved and appreciated Sophie Blackall's Hello Lighthouse and am also and of course tickled absolutely proverbially pink that it has been awarded the 2019 Caldecott Medal. For Hello Lighthouse truly is an utterly sparklingly special and delightful gem, presenting first and foremost (and most importantly) w With a wonderful and sweetly nostalgic marriage of lyrical text and glowingly imaginative but nevertheless always spectacularly realistically shining accompanying images, I have both absolutely loved and appreciated Sophie Blackall's Hello Lighthouse and am also and of course tickled absolutely proverbially pink that it has been awarded the 2019 Caldecott Medal. For Hello Lighthouse truly is an utterly sparklingly special and delightful gem, presenting first and foremost (and most importantly) what made lighthouses so historically significant and essential (and the immense pressure, as well as the often tedious but nevertheless always necessary work of the lighthouse keeper, and how in Hello Lighthouse when the lighthouse keeper suddenly falls seriously ill, his wife must then take over his job until his fever breaks, making sure the light is kept constantly shining and beaming to warn passing ships of otherwise treacherous ocean rocks and other potential threats as well as tending to her husbands needs, nursing him through his bout of what probably would have been a serious case of pneumonia). Both nostalgic and yes indeed also imbued with more than a bit of sad regret that almost ALL lighthouses are now generally automated and that there are thus for the most part no more lighthouse keepers, Hello Lighthouse is a paean and celebration of a bygone era and in my opinion also a glorification of the magic of the ocean, of the sea (and of course also an homage to the many lighthouse keepers who not only made sure that their lights were constantly kept glowing and shining especially at night and during foggy, rainy and snowy weather conditions but who also often had to risk life and limb when there was trouble, when ships foundered and sailors needed rescuing, and yes, I do kind of sometimes have to wonder whether having modern lighthouses totally automated is really all that safe, because indeed, if there is a shipwreck near a lighthouse nowadays, there are of course generally no lighthouse keepers to spring into action and lead immediate rescue efforts). I have a soft spot for lighthouses and I loved this book. The illustrations are beautiful, detailed, educational and touching. Absolutely worthy of the Caldecott Medal. The Afterward is excellent. I've always thought lighthouse keepers were heroes. Pair this with Keep the Lights Burning, Abbie, and oldie but a goodie. Sophie Blackall has outdone herself again in this beautifully illustrated book about Lighthouses. I used this as a unit study for our homeschool. It's full of facts and illustrations about the lighthouse. It also tells a unique story about a Keeper and his family as they live inside. It's a beautiful story using rich imagery and simple text to catch the young readers attention. I can not praise the illustrations enough, the art style is just amazing. I love how, at the end of 5 🌟 Bright Stars! I love the illustrations that accompany the spare text about the life of a lighthouse keeper just before the lighthouse is converted to electric, and his job is over. A somewhat melancholic read about the lonely life of a lighthouse keeper. Even with his wife and new baby installed, the family seems so tiny, and so, so . . . isolated. Blackall's artwork, however, is beyond exquisite. I'm so glad she won the Caldecott. I think this is the most beautiful book Sophie Blackall has ever made, and that, of course, is saying a lot. Beautifully illustrated. Gentle story of a time ling passed. Three years after winning the 2016 Caldecott Medal for her illustrations in Finding Winnie: The True Story of the World's Most Famous Bear, Sophie Blackall earned the Caldecott again, for Hello Lighthouse. Featuring gorgeous panoramas that evoke the salty spray of sea waves and the dancing lights of the aurora borealis, the story follows the tenure of one of the last lighthouse keepers. Technology is changing and it is becoming unnecessary to station a man at sea to warn ships that might otherwi Three years after winning the 2016 Caldecott Medal for her illustrations in Finding Winnie: The True Story of the World's Most Famous Bear, Sophie Blackall earned the Caldecott again, for Hello Lighthouse. Featuring gorgeous panoramas that evoke the salty spray of sea waves and the dancing lights of the aurora borealis, the story follows the tenure of one of the last lighthouse keepers. Technology is changing and it is becoming unnecessary to station a man at sea to warn ships that might otherwise run aground. Yet the romanticism of lighthouses persists to the modern day, and this book pays homage to it. Polishing the lighthouse lens so the beacon shines brightly, winding the clockwork several times a night, writing in the logbook, painting the small, rounded rooms of the lighthouse, fishing for food, doing housework: these are the keeper's regular chores, but there's still lots of time to feel bored and lonesome. Fortunately, his wife will join him soon, and the lighthouse will become a warm, happy home. The keeper clangs the bell in thick fog to caution ships, and when one crashes, he rows out to rescue the men. The demands of the job continually shift. His wife assumes the duties when he's ill, and he takes care of her when she grows heavy with child and their daughter is born. The keeper's days dwindle as arrangements are made to automate the lighthouse, but he and his family won't move far from the beacon he operated for years. When your soul belongs to the sea, you never leave its grasp. Gahhh! I loved this book. It's definitely one of my favorite picture books of the year. I loved the setting, the illustrations, the keeper of the lighthouse and his family. For anyone that appreciates the ocean and is a fan of lighthouses, this book will capture your heart! 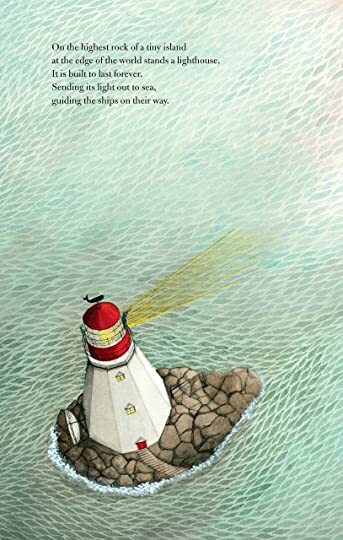 This beautifully illustrated children's picture book traces the daily life of a lighthouse keeper and his wife in a lighthouse on a very tiny island in the middle of the sea. We see the keeper doing his daily chores such as polishing the lamp’s lens, filling the oil and trimming the wick to keep the lighthouse lamp lit. We experience the birth of their first child, what happens when the lighthouse keeper is ill, and a rescue of some sailors whose boat was wrecked on the rocks. 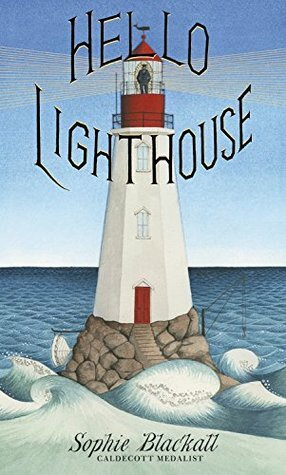 If you love lighthouses (as I do) or if you want a beautifully illustrated and historically accurate picture book to share with your children, this is it. I can’t say enough about the stunning, detailed Chinese ink and watercolor illustrations by Caldecott Medalist Sophie Blackall, especially those of the sea and the lighthouse. In addition, the end pages provide a short, more detailed history of lighthouses. This is truly a book to be devoured again and again, and then perhaps followed with a family visit to some real lighthouses. This is the beautiful story of a family's life in a lighthouse. It has gentle pictures and poignant text. The author shares information about lighthouses at the end, and that adds to the strength of the book. Hello Lighthouse is a pretty little picture book with a very nautical feel. I read it in e-book format, but I suspect that the physical versions are tall and narrow, reflecting the shape of a lighthouse. There's not much in the way of plot. Rather, the story shows the day-to-day life of a lighthouse keeper and--eventually--his family. We get to see the inside of a lighthouse and learn about the operation of it. We see the loneliness and the boredom, but also the excitement and danger that comes w Hello Lighthouse is a pretty little picture book with a very nautical feel. I read it in e-book format, but I suspect that the physical versions are tall and narrow, reflecting the shape of a lighthouse. There's not much in the way of plot. Rather, the story shows the day-to-day life of a lighthouse keeper and--eventually--his family. We get to see the inside of a lighthouse and learn about the operation of it. We see the loneliness and the boredom, but also the excitement and danger that comes with the position. All of this is illustrated in beautiful pictures that evoke a sense of calm. A nice note is included at the end that talks a little more about lighthouses and the people who ran them. It's kind of sad that this is no longer a way of life, but at least we still have the stories and--in some cases--the lighthouses themselves to remind us of a bygone era. The illustrations are beautiful in this story of a lighthouse keeper and his time spent tending a lighthouse in the far north. I did not find what is the point of this book. Just to tell about a lighthouse? There was no plot, no story, no characters. Too many details that are not making any difference. I didn't see what the author tried to send to the young readers. If the point is to introduce a more dry explanation of lighthouses, maybe that works. But if we want kids to be interested and to have a story there, I think that it is not achieving the goal. It was funny to think about this and The Light Between Oceans by M I did not find what is the point of this book. Just to tell about a lighthouse? There was no plot, no story, no characters. Too many details that are not making any difference. It was funny to think about this and The Light Between Oceans by M.L. Stedman. I loved that story, and there was a lighthouse keeper, that found a wife and had a baby in the lighthouse. The rest of the story is quite different, and is highly recommended for adults, not kids. From the author who gave us Finding Winnie. I loved this book about a man and then with his family living in a lighthouse. So begins a journey into the history of the lighthouse and the story of its keeper and his family as they tend to its needs, connected to the outside world by only the supply boat with its tins of beans and the occasional letter. Epic artwork captures the fury and majesty of the ocean, illustrating the importance of lighthouse and its keeper’s mission. Ms. Blackall’s ‘About Lighthouses’ essay at the back of the book will continue the history lesson. As she writes “Every lighthouse comes with stories of bravery and monotony, routine and adventure” She certainly has captured all of that quite fantastically in this book. This is a terrific jumping off point for a lesson in nautical traditions. Gorgeous words and illustrations! We love Sophie Blackall’s books! I love lighthouses and the illustrations - the illustrations are amazing! I like the story and the "about lighthouses" at the back of the book. Just and excellent Children's book. This beautifully illustrated picture book traces the experiences of a lighthouse keeper from his arrival at the lighthouse until his position as keeper becomes obsolete due to technological advances. The lighthouse is shown in all seasons and situations, and the keeper himself lives his life: waiting for his wife to arrive, then reuniting with her, falling ill and having his wife take over his duties while he gets well, welcoming his baby daughter into the world, rescuing the victims of a shipwr This beautifully illustrated picture book traces the experiences of a lighthouse keeper from his arrival at the lighthouse until his position as keeper becomes obsolete due to technological advances. The lighthouse is shown in all seasons and situations, and the keeper himself lives his life: waiting for his wife to arrive, then reuniting with her, falling ill and having his wife take over his duties while he gets well, welcoming his baby daughter into the world, rescuing the victims of a shipwreck, and, above all, caring for the lighthouse. An author's note at the back of the book explains how Blackall became interested in the subject of lighthouses and quickly describes some of her research. Though I had to read this book digitally, thereby losing some of its impact, I still really enjoyed the pairing of Blackall's child-friendly, playful text with her detailed illustrations. When I was a kid, I loved any book that showed both the inside and outside of a building, and this book will likely appeal to many of today's kids for that same reason. Blackall also makes great use of different perspectives in her art, especially on the spreads relating to the birth of the lighthouse keeper's baby. Her use of circles reminiscent of portholes is also clever, and it helps the reader to feel the closeness of the small space inside the lighthouse and to remember at all times the roundness of the rooms, and of the telescope lens the keeper uses to look out over the sea. Hello Lighthouse gives the reader a look at a unique lifestyle - that of a light house keeper and his family. They are out on the ocean, far away from community for extended periods of time. They must depend upon themselves and nature. Sophie Backall's illustrations are detailed and beautiful. The reader will want to talk his/her time and pour over each page. The Author's note: "About Lighthouses" at the end of the book, will help adults give the reader additional important information. This boo Hello Lighthouse gives the reader a look at a unique lifestyle - that of a light house keeper and his family. They are out on the ocean, far away from community for extended periods of time. They must depend upon themselves and nature. Sophie Backall's illustrations are detailed and beautiful. The reader will want to talk his/her time and pour over each page. The Author's note: "About Lighthouses" at the end of the book, will help adults give the reader additional important information. Beautiful! I predict this will win a 2019 Caldecott! And it did!! 2019 Caldecott Medal. Stunning illustrations and lovely story. Sophie Blackall grew up in Australia where she learned to draw on the beach with sticks, which has not altogether helped her sense of perspective. She completed a Bachelor of Design in Sydney, which furnished her with useful Letraset, bromide and enlarger machine skills. The following few years were spent painting robotic characters for theme parks, providing the hands for a DIY television show, a Sophie Blackall grew up in Australia where she learned to draw on the beach with sticks, which has not altogether helped her sense of perspective. She completed a Bachelor of Design in Sydney, which furnished her with useful Letraset, bromide and enlarger machine skills. The following few years were spent painting robotic characters for theme parks, providing the hands for a DIY television show, and writing a household hints column. In 2000, Blackall was inveigled by New York. She convinced her husband, and two small children (who couldn't talk and had no say in the matter), to pack suitcases and sense of adventure and join the diaspora. After two months of pounding the streets, portfolio in hand, and despite the tireless efforts of her agent, the return plane ticket was cashed in to pay the rent. Just when the highlight in the day had become half a can of Budweiser at six o'clock, the fax machine coughed and spluttered and delivered a commission of nine illustrations for The New York Times. After lots of editorial work and several animated TV commercials in the UK, the first children's book Sophie Blackall illustrated was Ruby's Wish by Shirin Yim Bridges (Chronicle), which won the Ezra Jack Keats award in 2003. Since then, she has illustrated Meet Wild Boars by Meg Rosoff (Holt) which won the Society of Illustrators Founders Award; Summer is Summer by Phillis and David Gershator (Holt); What’s So Bad About Being an Only Child? by Cari Best (FSG); Red Butterfly by Deborah Noyes (Candlewick); Ivy and Bean (books one through five) by Annie Barrows (Chronicle); Jumpy Jack and Googily by Meg Rosoff (Holt); Wild Boars Cook by Meg Rosoff (Holt); and Wombat Walkabout by Carol Diggory Shields (Dutton).